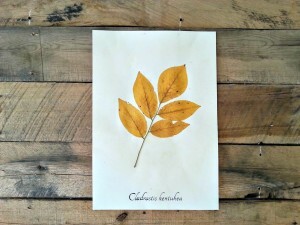 Ecobota specimens are made with the highest quality botany and herbarium supplies. Each specimen is mounted on professional ivory herbarium paper made from 100% rag content. This paper has a neutral pH factor and is acid free to prevent unintentional yellowing and deterioration. It is .012 caliper. Specimens are affixed with my own blend of botany paste – formulated to be acid free and non-toxic (unlike most retail formulations). My collection labels are printed on a cotton-pulp paper made from 50% post consumer fiber. Each collection label – containing the taxonomy, collection date, location, and individual collection number – is placed on the back of the specimen. My frames are wood and are hand distressed. Each famed piece comes with a brown paper dust cover and hanging hardware already in place. Since I prefer the old Victorian “Curiosity Cabinet” look (paper slightly aged and frames a little dusty and distressed, like a prized find in your great-aunt’s attic), my specimens have some antique touches. I make a batch of walnut ink every fall and use the resulting dye to lightly stain the mounting paper before I affix the specimen. This gives each piece a soft antiqued appearance. I also hand letter the scientific Latin across the bottom of each piece like the Victorians did. I think this simple arrangement of plant and name is the most visually appealing. However, traditional herbarium specimens have the collection label in the bottom right hand corner of the paper. Should you prefer this look, I can place the labels there upon request, or build you a custom collection with front facing labels. Each Ecobota piece is treated with a special UV resistant coating. Dried flowers are known to fade and discolor when exposed to UV radiation from the sun and the application of this coating protects your piece from this process in normal home lighting conditions. However, the sun is a powerful bleach – specimens will fade if placed in direct sun, even with the added protection. 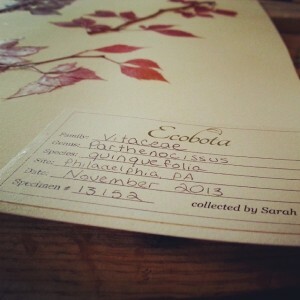 Lastly, my specimens are gathered from the Philadelphia area, most from my own garden. The ones that are wild collected are done sustainably with complete regard for the ecosystem, seed bank, and wildlife in the area (and they are usually invasive species, anyway).